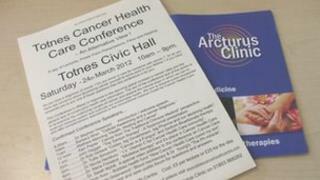 A conference on alternative treatments for cancer being held in Devon is being investigated. One speaker at the Totnes Cancer Care conference is a former doctor from Italy, who claims cancer can be cured with baking soda. The clinic is run by Dr Stephen Hopwood, a former GP who now favours holistic medicine. Devon County Council confirmed trading standards staff were investigating the conference and the clinic. Trading Standards is the body which enforces the Cancer Act and the Consumer Protection From Unfair Trading Regulations 2008, to protect vulnerable people from false and misleading advertising. However, it told BBC News it was unable to comment further while its enquiries were ongoing. Totnes Conservative MP Dr Sarah Wollaston - who is also a qualified GP - contacted them after a number of constituents raised concerns about the conference, which is due to be held on Saturday at Totnes Civic Hall. She said one particular issue was Dr Tullio Simoncini's claim that cancer is a fungus that can be cured with sodium bicarbonate. On his website, Dr Simoncini said he was struck-off as an oncologist, because he administrated sodium bicarbonate instead of conventional chemotherapy. "If he can provide any evidence base whatsoever that sodium bicarbonate will actually alleviate symptoms, then let's see it, but I'm afraid nobody else in the conventional cancer community would actually share his view," said Dr Wollaston. "What I'm having a go at here is advertising specifically to people who are at the most vulnerable time of their lives," she said. "There are, very rightly, safeguards in place to protect people against adverts for remedies which really have no basis in evidence." Dr Simoncini has been unavailable for comment. However, Dr Hopwood, who describes himself as a "holistic physician", accused the MP of being a "shop front" for the pharmaceutical industry and claimed she did not have enough knowledge of complementary medicine to comment. "[Dr Wollaston] has a fair amount of knowledge, but she doesn't have a great deal of knowledge about the principles and practices of health cultivation," he said. "She has been a shop front for the pharmaceutical industry like most GPs and that's been the bread and butter of her work." Sodium bicarbonate is used in conventional medicine to treat a range of conditions, such as acid indigestion, heartburn, renal stones and aspirin overdose. It can also be used in emergencies to treat metabolic acidosis which may occur after a heart attack. Charity, Cancer Research UK said there was "little or no hard scientific evidence" alternative approaches improved survival rates and it would advise people not to choose alternative therapy instead of conventional medicine. However, it said some cancer patients do find complementary therapy - which is taken alongside and not instead of - conventional treatment can help improve their general wellbeing. "We would also advise people to be very wary of any therapist who claims that they can 'cure their cancer'," it said in a statement. "If a cancer patient is considering taking a complementary treatment alongside their conventional treatment we would advise that they talk it through with their doctor first."